First days on my roadtrips are usually my longest hauls. Because I’m trying to get from well-traveled areas out to where the adventure of discovery can begin. Today, the first day of the East to The West Roadtrip, was no exception. With all my years of skiing in Tahoe, I’ve gotten myself from the Bay Area and up and over the Sierras too many times to count. On a recent roadtrip, I mixed it up a bit by leaving Interstate 80 for Route 50 which is the old Lincoln Highway, and after Sacramento, roughly follows the old Pony Express Trail. That was my route today. It was a hell of a lot easier without a freak early snowstorm and it was a thousand times easier in a Range Rover Evoque than in a Prius. In fact, when I hit Nevada and 75 mile an hour speed limits, I realized I’m in a whole new world of travel. I don’t think the Prius, even if I floored it, could have reached 60 MPH. 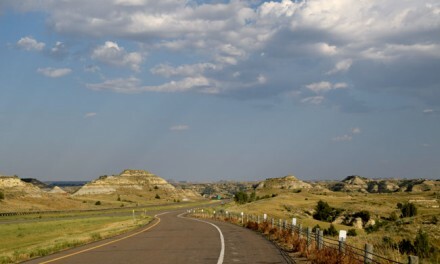 So the drive up the Lincoln Highway was uneventful and mercifully free of long-haul truckers who all prefer Interstate 80. Route 50 is much more forested with few of Interstate 80’s dramatic views. But 50 attempts to compensate for that by offering twice as many scenic turnouts. One turnout offered the chance to pose a trivia question to my Facebook friends. 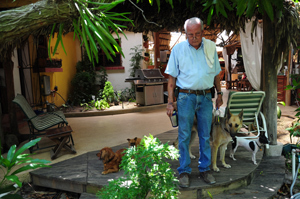 Who remembers Spider Sabich who was born and grew up in this tiny town? 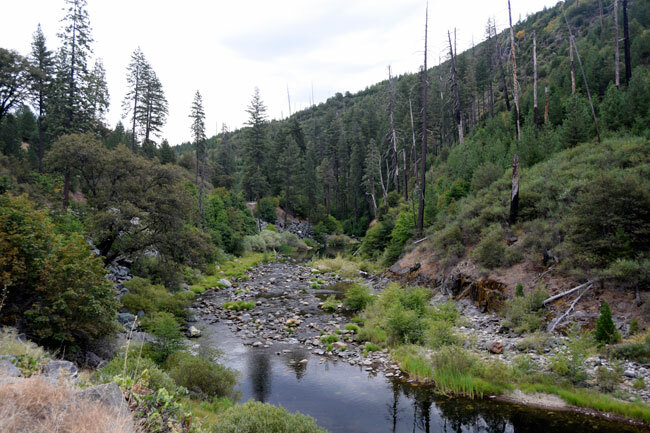 I also got some shots of the North Fork of the American River. Is it only Western rivers that are identified by their forks? Then there was that moment that never fails to surprise, no matter how many times I do it. I don’t think I can think of another transition between two states that is more dramatic than that between Northern California and Central Nevada. First you are in the thick pine trees of the El Dorado forest climbing up the Sierras. Then you hit the California side of South Lake Tahoe which is mostly stuck in a 1950s time warp with log cabin motels, diners featuring vintage neon and chainsaw sculptures of bears, and, of course, the beautiful blue waters of Lake Tahoe. Then, with no warning, you hit the State Line and the funky log cabin motels give way to ten story casinos, and mega chains like Planet Hollywood and the Hard Rock. You veer away from the lake and suddenly you are descending steeply into the Carson City area. The trees stop abruptly and you are staring at a landscape of rocks, sagebrush and bare mountains. I should have taken pictures, but I was anxious to get the hell away from Carson City as fast as I could after a bathroom stop at McDonald’s and a gas up at Chevron. During a previous roadtrip to Nevada to navigate the Loneliest Road in America, I learned there is much to love about Nevada. But there is much to hate and fear about Carson City. One end of this capital city is a massive boulevard of strip malls and Casinos, the other is an increasingly scary array of trailer parks, some of which are brothels, and billboards warning you to report bad smells as they may indicate meth labs. Somewhere in the middle is the tiny historic core of the town, but I had no desire to seek it out. At this point, I decided to blast my way up 80 to my ultimate destination of Winnemucca. It was an unbroken landscape of alkali flats and sagebrush. Pulling into a rest stop, I learned Route 80 pretty much just paved over the California Trail, one of the pioneer wagon train routes West. It was so dangerous and murderously hot that most wagon trains tried to move only at night. That gave me something to think about as I cranked the air conditioning and cruised along at 75. I pulled into Winnemucca in time for a quick tour around the tiny Humboldt Museum, had a Basque family style dinner at the Martin Hotel, then took a quick trip down the boulevard to check out the neon on the casinos. Winnemucca: DONE. In fact, my neighbor, who has a summer home in northern Idaho, encouraged me to blast straight through to Boise. But, besides not wanting to do that long a drive, I had another reason to stop in this strange little town. The genesis of this trip came when I realized North Dakota and South Dakota are two of only three or four states I’ve never visited. It became a list check-off thing. Then during an early planning session, the old Johnny Cash song “I’ve Been Everywhere” came on the radio. I realized I’d been to almost every place The Man In Black mentions. Except Winnemucca. So it had to be included. As I drove into town, a huge dust and wind storm blew up just like in the lyrics. So I’m calling today a success. Even if all I did was drive. To Winnemucca. Take it away, Johnny. 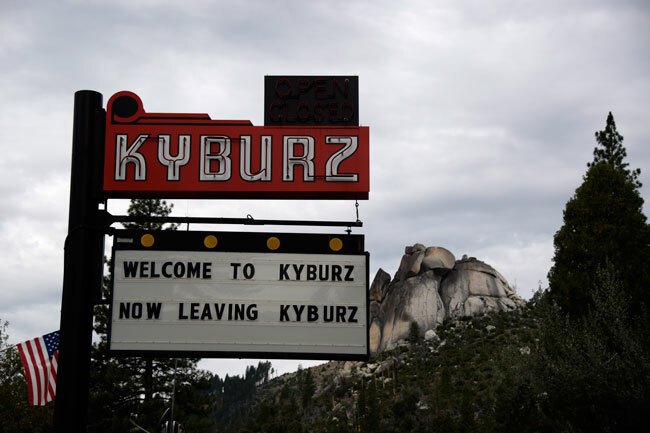 OMG – my friend has a cabin at Kyberz!! I am immediately homesick. As a kid we drove from Sacramento to West Yellowstone. 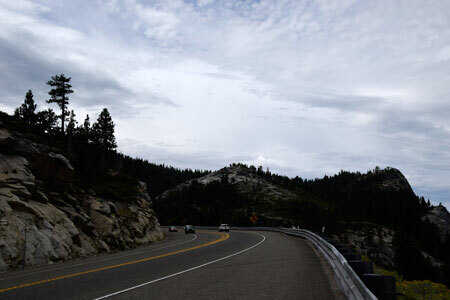 That drive from Tahoe – to Twin Falls seemed to take forever. 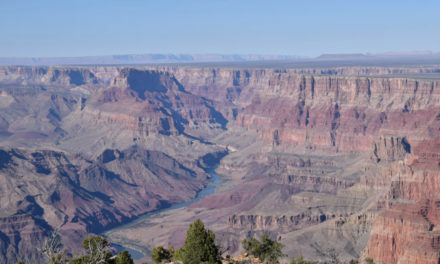 And talk about ‘boring’ Nevada scenery … But Arizona changed my mind and my heart. Hope you get to have the same transformation about N.Dakota and S.Dakota. Great stories of your adventure….luv the J.Cash reference and romance….God Bless ya in your travels! Stay safe.